Multipurpose Wing-In-Ground Effect aircrafts , or WIG will now be manufactured in Melaka, Malaysia. 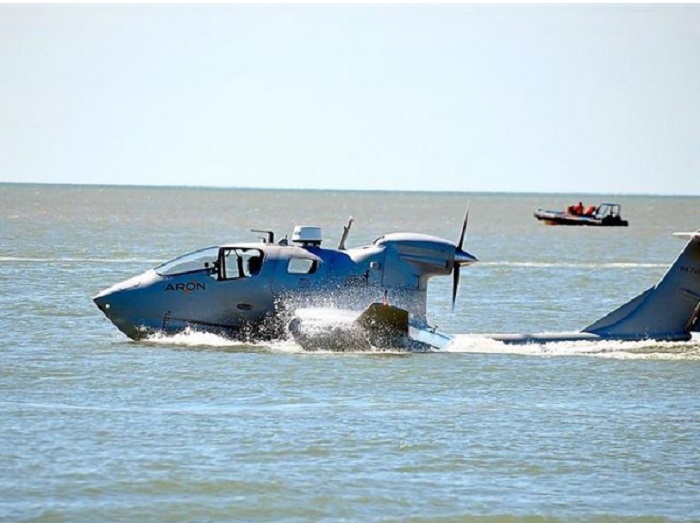 These low altitude cruising crafts can fly at a height of 150 meters over flat surfaces, which is really impressive; but this ability have been questioned by netizens in Malaysia (we’ll get to that in a bit). 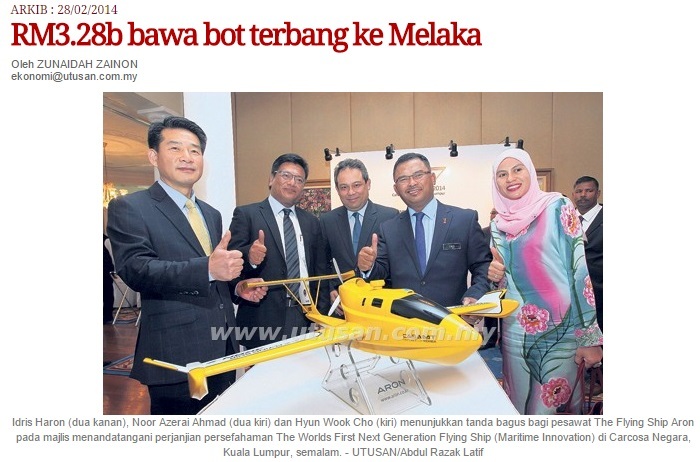 Bernama reported that Melaka will be manufacturing these multipurpose Wing-In Ground (WIG) aircrafts by 2017 and Chief Minister Datuk Seri Idris Haron projected that these crafts will invite more investors to the state. These futuristic vehicles won’t only just invite businesses, it will bound to garner the attention of tourists as well. These vehicles are built by Aron Rinan Sdn Bhd with the technology from South Korea. 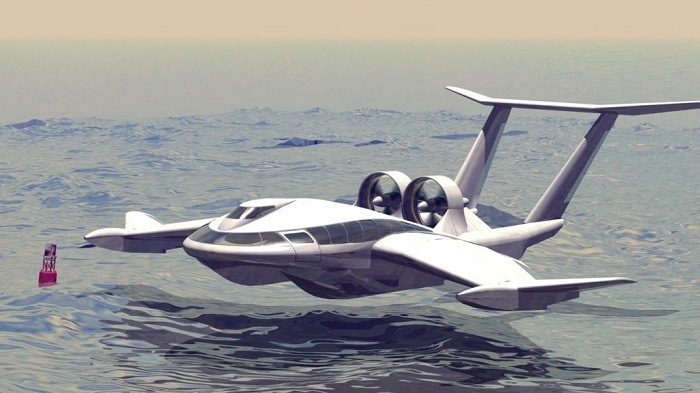 US$1 Million Per Flying Ship! Noor Azerai Ahmad, the president of Aron Rinani said that there have been over 100 units of the vehicle being ordered via their company. The first unit is due to be ready by June this year and cost US$1 million (RM3.5 million). The current factory is only able to product 7 units per year. However, this will soon be solved. President Noor Azerai said, “A new plant will be constructed in Teluk Gong, Alor Gajah, which, once completed can produce 50 ground effect vehicles annually.” While this is a great step into the future, netizens are having mixed reactions regarding what Melaka can do, ranging from pride, to disbelief. 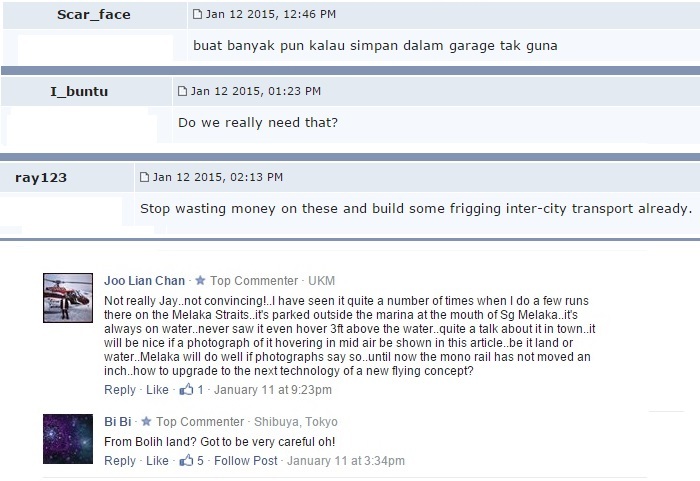 There are mixed reactions to what Melaka has achieved. While some lauded Malaysia for being able to come up with these crafts and congratulated Melaka for being able to do this, others were are less impressed. As of now, there seems to be no image of these Wing-In-Ground Effect Aircrafts in action. Some netizens are impressed by the effort the Malaysian government are making towards being a technological hub in Asia. 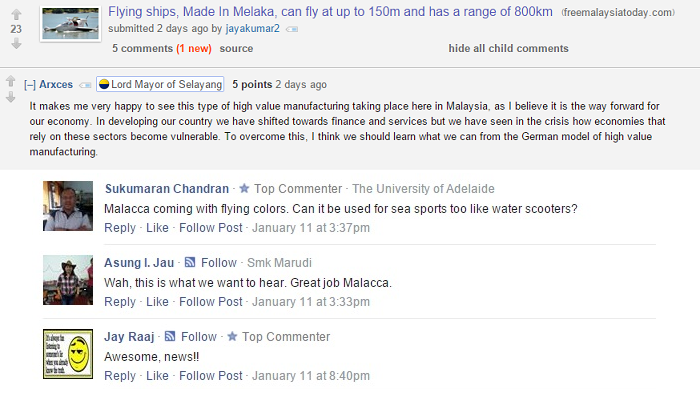 A commentor from Reddit, a social networking online site, said, “It makes me very happy to see this type of high value manufacturing taking place here in Malaysia, as I believe it is the way forward for our economy.” Others praised Malacca for being able to manufacture flying ships, stating that, “Malacca coming with flying colors,” and jokingly asked if the vehicle could be used in sea sports like water scooters. Another reader from FreeMalaysiaToday.com shared that this vehicle may be useful for helping with flood relief and rescue. This is especially true for those areas that are inaccessible by ground or air. “I’m sure as the time goes, more improvisation will lead to mass productions,” Gee Mo commented on the article. Others, however, are less impressed by the news. The reaction for the news article regarding these low flying aircrafts are divided when it comes to readers from TheStar, with 38% happy, 22% inspired, 9% amused, 3% sad, 8% angry and 20% annoyed, though there are no explanation as to why the readers feel that way. Other commentors have questioned if there really is a need for flying ships in Malaysia and that money should be spent on improving inter-city transports instead. This initiative did not come cheap. Utusan Online reported in February 2014 that the investment to bring these low flying ships to our waters cost a whooping RM3.28 billion. This is a collaboration between Rinani International Aeromarine Sdn. Bhd. and Aron Flying Ships Ltd. According to the report, this collaboration is projected to bring 2,500 new jobs into the market. All the parts are actually brought in from South Korea but set up and put together in Melaka. President and Chief Executive Manager of Aron Flying Ships Ltd. said that the company chose Malaysia due to the lower operating cost and the complete infrastructure. These flying ships have a lot of potential and in the case of severe flooding, it could be used to transport floor relief or move the sick and elderly to high grounds. But with any technology, frequent maintenance and proper monitoring is necessary to ensure that the machine works effectively and consistently. This is what worries me most, as Malaysia might not have the best record with taking care of their high tech toys. Remember two of these Scorpene submarines commissioned by the Royal Malaysian Navy in June 2002? These impressive-sized submarines were completed in 2005 and 2006 respectively. Both vessels are deemed Perdana Menteri Class and cost RM2 billion each. These vessels are exclusively for combat uses only and as such, these submarines lack the ability to see underwater, rendering it completely useless for search and rescue operations. 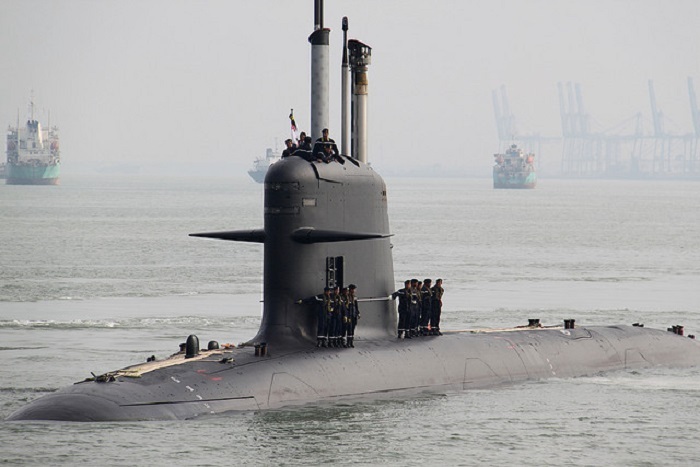 For now, the Scorpene submarines in Malaysia are essentially RM2 billion decorative combact vessels with maintenance costs from RM270 million to up to RM600 million per year. The completeness of the infrastructure and manpower (crew, support staff, ect.) for the vessels remain questionable as well. We can only hope the flying ships don’t suffer the same fate.